I am helping plan a wedding for a best friend. The reception will be a casual one at their home. We did want programs for the church. The bride wanted to cut expenses by not having any flowers. I was AGHAST. (Not really, I just wanted to use that word.) Anyway...I offered to give the couple flowers as their wedding present. In order not to break the bank, I did some research on the meaning behind flowers. The above paragraph is on the back of the program. I printed them landscaped onto card stock to save paper. we were going to use yellow azalea bushes on the alter. 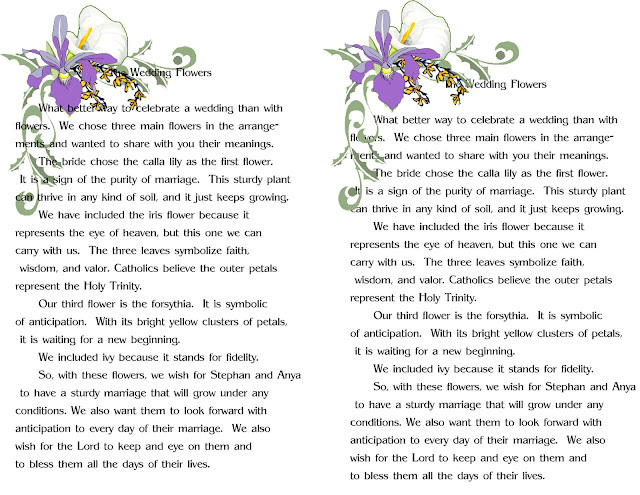 The wedding colors are blue and yellow. 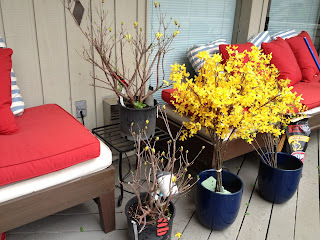 YELLOW AZALEAS ARE RARE, but I found two bushes at a local nursery. They were the only two they had. I bought them 6 weeks in advance. The nursery let me keep them in their green house for a month. I brought them home and noticed there still WASN'T ANY GREENERY. Alas, yellow azaleas are deciduous plants. I did not know any azaleas were deciduous. My friend said, "Ooops, I forgot about that." It is one week until the wedding. In the photo above you can see the plants starting to flower, but the flowers will die before there is any greenery. Scratch that plan. The same nursery had two blue pots on sale. 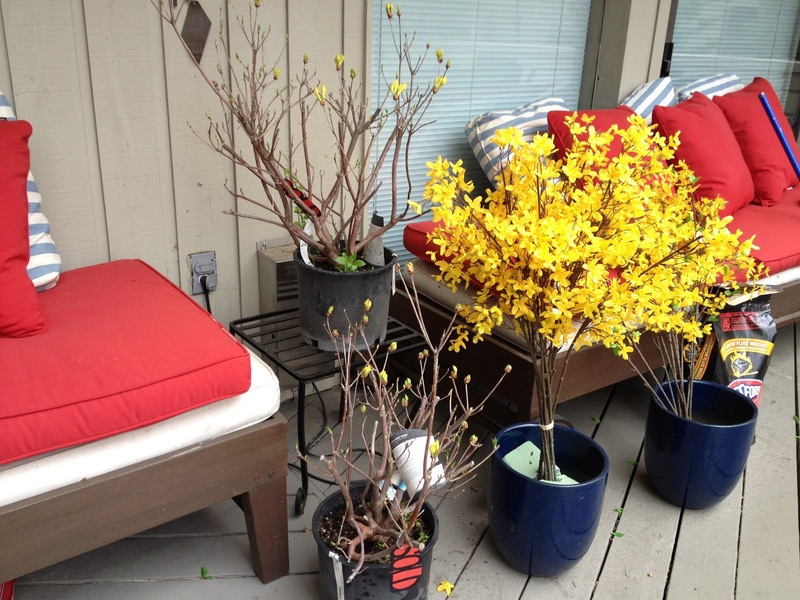 I decided to make the yellow silk forsythia into little trees. See same photo above. The live hydrangea, lillies, and irises will be below this level. I bought two beautiful ivy plants for the base of the arrangement. 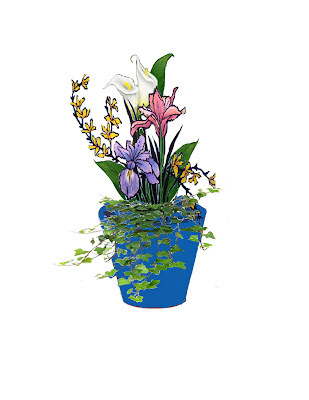 The clipart above is just to help me visualize what I want. 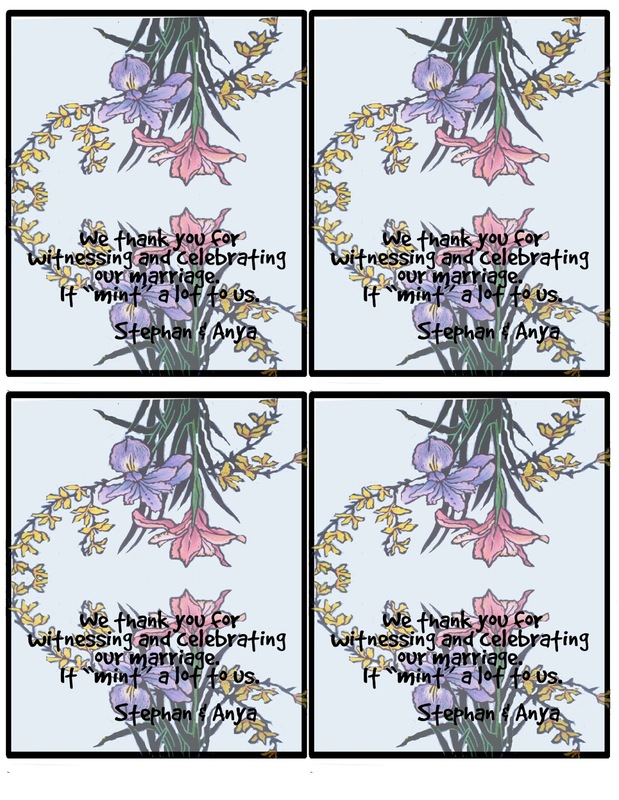 Going with the same flower theme, we made cellophane bag toppers with a thank you message. 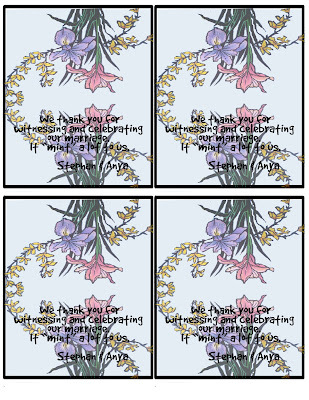 It says, "We thank you for witnessing and celebrating our marriage. It "mint" a lot to us." We are putting GIRL SCOUT THIN MINTS in each bag. Yummy!!! Great ideas! I really like to mix artificial flowers in with real ones...keeps people guessing. I can't wait to see the finished project...promise that you will share photos. I am doing a mix of real and fake flowers for an arrangement at the ceremony site (in a public garden)for my son's wedding on June 1. I need to learn some tips from you.